Mercer Culinary is a well-respected name in the cutlery industry, and they’ve been in the industry for more than 30 years. Trusted by industry professionals, Mercer is the main supplier to over 90% of the culinary academies in North America. That’s why I always recommend Mercer Culinary’s Genesis 6 piece Set to anyone looking for a professional set of kitchen knives. It’s a great starter set, or a smart choice for anyone looking to upgrade their knife collection. I’ve been using this set for quite a while, and it still impresses me every time I use it. These knives are a bit bulkier than what you may be used to, but they feel great in your hand and they’re highly durable. Truly, there’s a lot I love about this set, and here’s my review. 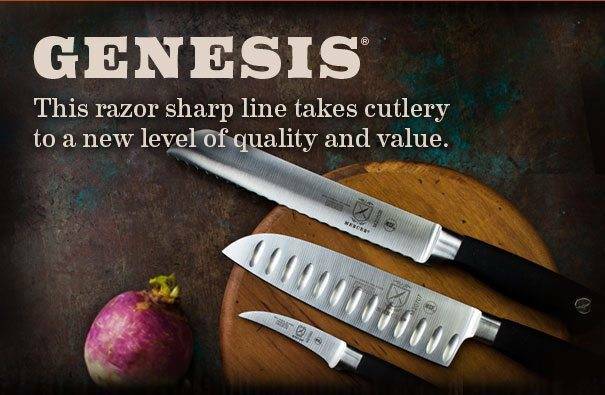 Durability comes from the precision forged German steel used to create the blades of these knives. In all the years that I’ve used this set, I’ve never had a single blade rust, corrode, or discolor, and that’s thanks to the high carbon steel used to forge each blade. Provided you care for these knives properly, they’ll still look brand-new years after you purchase them. Another reason why this set is so durable is because they’re forged knives, which means that they’re made from a single piece of steel that has been strengthened under intense heat. It’s hard to beat the quality of forged German steel, which is why some of the top knives in the world are forged with it. Also, these knives are full tang, which means the blade runs the entire length of the handle. One of the first things that you’ll notice about these knives is that their grip is heftier and bulkier than other high-quality knives, like Wusthof. At first, I didn’t like how bulky the grip was, but once I started using the knives, I quickly realized that the bigger grip was necessary to ensure proper balance. That’s why these knives feel so great in your hand. 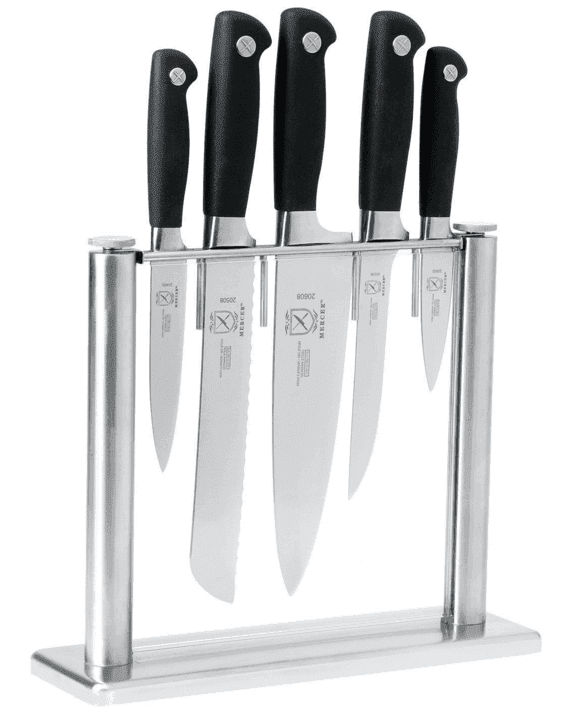 They’re built with substantial bolsters to help improve each knife’s balance. And they’re weighty, which makes it easy to chop, slice, mince, and dice. These knives glide right through food, so prep work is virtually effortless. Naturally, you would use the bread knife for cutting bread, but I also like to use this knife to slice delicate foods like tomatoes. With an 8” blade, you can easily slice bread loaves of all sizes – even boules. The Mercer Bread Knife included in the set. Between the paring, utility and chef’s knife, you’ll be able to prep just about any food from onions to garlic, tomatoes, herbs, and tough root vegetables. And the boning knife is ideal for prepping meat and fish. From chicken to pork loin, salmon and lamb, I have used this knife to bone just about every kind of meat, and it’s never failed me. Boning has never been easier. With such a well-rounded collection of knives, this is the perfect knife set for anyone who is just starting their kitchen knife collection. It’s also a great choice if you’re looking to upgrade your current set of knives. The chef’s knife. The handle is very comfortable. I’ve worked with a lot of knives, and have to say that the Genesis knives have one of the most comfortable grips I have ever felt. They’re made from a rubberized material and feature an ergonomic design. Typically, I prefer classic wood handles on my knives, but whenever I hold one of these knives in my hand, it feels like the handle was made just for my hand. Never underestimate the importance of a comfortable, durable grip when it comes to kitchen knives. If a knife is uncomfortable to hold, it will be a nightmare to use. Like any other commercial-quality knife, Mercer Culinary’s knives are incredibly sharp. While they stay sharp for a while, I do recommend investing in a good honing steel. Mercer actually offers one to go with the Genesis collection. I’ve never personally used this honing steel, but I’ve heard great things about it. One thing I do have to note is that you want to wash these knives by hand to keep them sharper for longer. I made the mistake of placing the chef’s knife in the dishwasher and wound up having to re-sharpen it the next day. In short, yes, these knives are sharp, but you’ll need to sharpen them regularly to keep them this way. 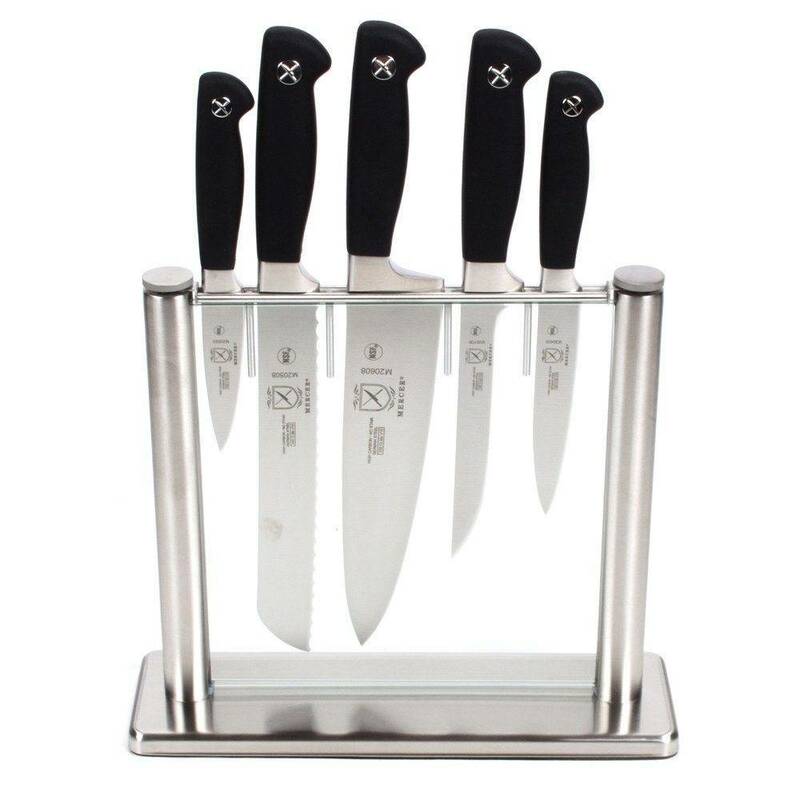 Along with the five knives in this set, you’ll also receive a tempered glass knife block. This is actually one of my favorite features about this knife set, and is part of the reason why these knives stay sharp for a while. The design of this knife block is similar to the magnetic strips you see many people using now. Rather than sliding the knife into a slot on a wooden block, these knives slip upright into a tempered glass block. Storing knives this way is simpler and easier, and it helps protect the blades better than a conventional knife block. That said, this type of block is a little inconvenient. Most knife blocks allow you to store your knives at an angle, which means that you can easily store your block on your counter tops. But because these knives have to be stored upright, they probably will not fit underneath your cabinets. This wasn’t a big deal to me, but is something that you should be aware of. I recommend storing the block on your countertop and simply pulling it towards the edge of the countertop when you’re ready to use it. It’s a little inconvenient, but a workable solution if cabinet clearance is a problem. Another great thing that I want to mention about the knife block is that it doesn’t tip over very easily. So, it’s possible to lean the block forward, pull out the knife you need, and return the block to a standing position without the other knives falling out. And the block comes apart for easy cleaning, too. 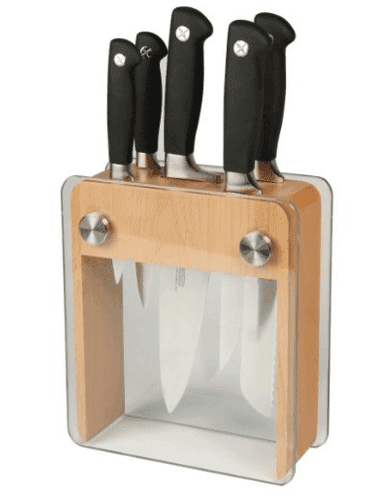 Now, Mercer also offers a different knife block, which is a wood block with a tempered glass casing. I personally chose the tempered glass block because it was more practical and versatile. It was also significantly less expensive than the wood block set. The wood block is beautiful, but the tempered glass block offers a sleeker, more modern design. Is The Mercer Culinary Genesis Good For Your Needs? The Mercer Culinary Genesis offers commercial quality cutlery at an affordable price. These are the same knives that are trusted by culinary institutes all over North America. Personally, I’ve been using these knives for years, and they’re still just as good as the day I bought them. Yes, they do have to be sharpened from time to time, but I’ve yet to have a single blade rest or corrode. This is a highly durable set of knives that you’ll be using for years to come. I’ve been a butcher for almost 25 years, and used hundreds of different knives, both good and bad ones. I also love nature, I’ve been a hunter for most of my life, always practicing and improving my survival skills.